Thank you to 7-11 for providing signage placement to promote ball hockey. With the 7-11 app you can get your favorite drinks for free with 7RewardsSM from 7-Eleven. Buy 6 cups, and any 7th cup is FREE when you download and scan the app. 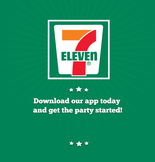 Download the 7-11 app today and get the party started! Winner's Way Source for Sports is the official supplier of FSMBH Team Jerseys. If you want quality products and service then shop locally and visit Winner's Way Source for Sports for your athletic needs! R & M Promotions and Signs is ball hockey's go to supplier for signage. Shop locally and visit R & M for all your promotional needs and receive 5 star service! Thank you to our local community Tim Hortons ownership group for sponsoring 5 TimCards valued at $10.00 each in support of our 2018 Volunteer Parent Coaches! Ball Hockey Night with the Edmonton Oil Kings! Each spring, in March, an Oil King Game is dedicated to the sport of ball hockey. Players, Teams, Coaches, Family and Friends all benefit from the discounted ticket price on this exclusive night! 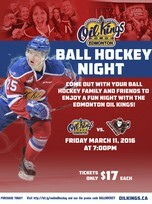 Buy a ticket and enjoy the Oil Kings home game with other ball hockey enthusiasts.